Did Bernie Sanders Commit ‘Blood Libel’ Against Israel? That’s what some of the country’s defenders are saying. But his claim that Israel used indiscriminate force in Gaza is accurate. Last week, the New York Daily News did an interview with Bernie Sanders in which Israel’s 2014 assault on Gaza (Operation Protective Edge) came up. When the interview was published, all hell broke loose. So, what did Sanders actually say? None of this is exceptional. It’s just the “new normal” among liberal American Jews. I think it is fair to say that the level of attacks against civilian areas…and I do know that the Palestinians, some of them, were using civilian areas to launch missiles. Makes it very difficult. But I think most international observers would say that the attacks against Gaza were indiscriminate and that a lot of innocent people were killed who should not have been killed. Look, we are living, for better or worse, in a world of high technology, whether it’s drones out there that could, you know, take your nose off, and Israel has that technology. And I think there is a general belief that, with that technology, they could have been more discriminate in terms of taking out weapons that were threatening them.… I’m just telling you that I happen to believe…anybody help me out here, because I don’t remember the figures, but my recollection is over 10,000 innocent people were killed in Gaza. Does that sound right?… I don’t have it in my number [sic]…but I think it’s over 10,000. My understanding is that a whole lot of apartment houses were leveled. Hospitals, I think, were bombed. So yeah, I do believe and I don’t think I’m alone in believing that Israel’s force was more indiscriminate than it should have been. Sanders got the casualty figure wrong. 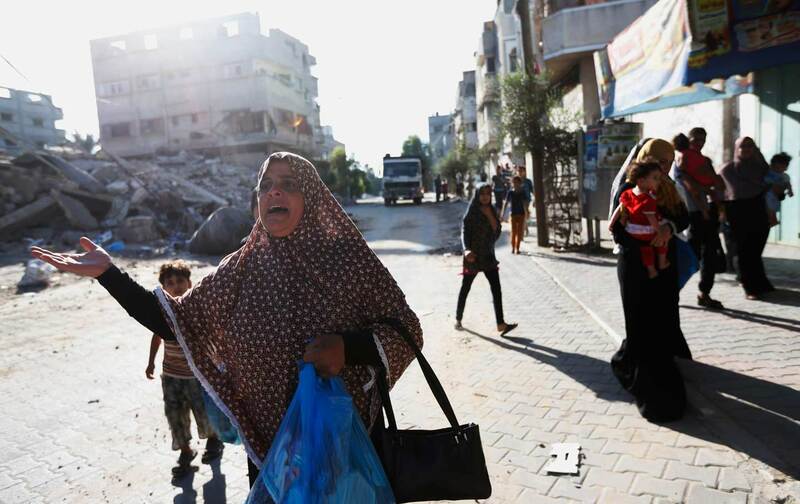 Some 2,200 Gazans were killed, of whom approximately 1,500 were civilians, 550 children. But he kept repeating that he couldn’t remember the exact number. He also pointed out, “I’m not going to run the Israeli government. I’ve got enough problems trying to be a United States senator or maybe president of the United States.” Is it a sin if a candidate vying for office in an American election and aspiring to serve the American people doesn’t remember precisely how many Palestinians were killed in each of Israel’s successive massacres? (Israel has carried out eight major operations against Gaza in the past 12 years.) It’s also not as if Israel is incapable of killing so many people. It killed 10,000–18,000 Lebanese and Palestinians, overwhelmingly civilians, during its 1982 invasion of Lebanon (Operation Peace for Galilee). Oren says that claiming Israel bombed hospitals during Protective Edge is a blood libel. But Israel did in fact destroy or damage 17 hospitals and 56 primary healthcare centers during the operation. Sanders was also correct in stating that many Gazan dwellings were leveled. In fact, Israel destroyed 19,000 homes. It all looked like a science fiction movie…serious levels of destruction everywhere.… [E]verything was really in ruins. And non-stop fire all the time. Before the entrance on foot [to the Gaza Strip], a crazy amount of artillery was fired at the entire area.… Before a tank makes any movement it fires, every time. Those guys were trigger happy, totally crazy. [Y]ou’re shooting at anything that moves—and also at what isn’t moving, crazy amounts.… [I]t also becomes a bit like a computer game, totally cool and real. It was total destruction in there—the photos online are child’s play compared to what we saw there in reality.… I never saw anything like it. [S]hells are being fired all the time. Even if we aren’t actually going to enter: shells, shells, shells.… What happens is, for seven straight days it’s non-stop bombardment, that’s what happens in practice. If blood libel denotes false representations of the Jewish people that induce anti-Semitism, then the likes of Oren and the ADL, who pretend to represent the Jewish people as they whitewash Israel’s criminal conduct, incarnate a blood libel. By contrast, Sanders’s noble candidacy—his identification with the underdog and, yes, his recognition of Palestinian suffering—is a redemptive moment in the saga of modern American Jewry. Norman G. FinkelsteinNorman G. Finkelstein has written several books on the Israel-Palestine conflict, including Knowing Too Much: Why the American Jewish Romance with Israel Is Coming to an End (OR Books, 2012) and, most recently, Method and Madness: The Hidden Story of Israel's Assaults on Gaza (OR Books, 2014).